The Galapagos islands are an incredible visual feast and our photo journal demonstrates just how beautiful a Galapagos cruise can be. On our Galapagos island tours, you can experience fascinating wildlife and breathtaking scenery that you won’t find anywhere else on the planet. These pictures show just what an exhilarating place the Galapagos islands are, and with our expert tour guides, you’ll be able to see all of these sights and more firsthand on your Galapagos cruise. 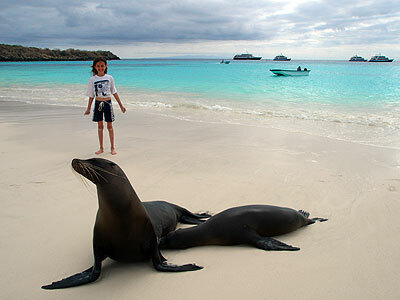 What better way to engage your young ones than with a Galapagos family vacation? 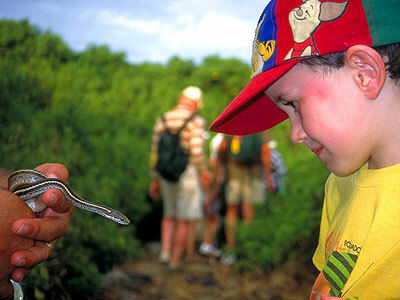 Whether you’re young or young at heart, Galapagos island tours will allow you to see the natural world in a new way. From marine iguanas to flightless cormorants, the Galapagos is teeming with unique species that will increase anyone’s appreciation for the natural world. 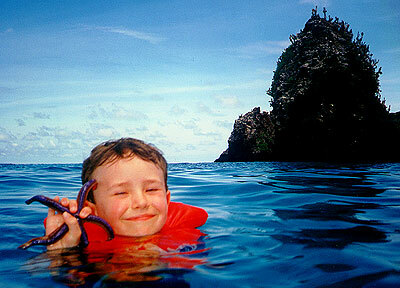 Book your Galapagos family vacation with us today and discover the wonders of the Galapagos for yourself! 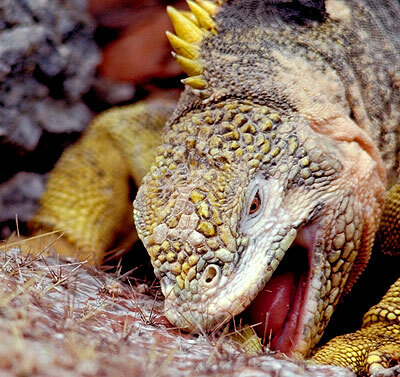 The Galapagos Islands offer the visitor an incredibly rich and diverse landscape to explore and photograph. Each visitor site is unique with respect to landscape and wildlife. Tower Island in the north of the archipelago is one of the richest in bird life. 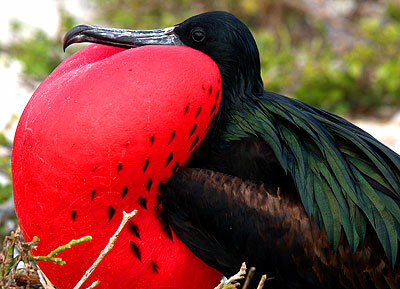 The male frigates inflate their bright red jugular sac to attract females. This courtship activity reaches its peak on Tower between March and June. 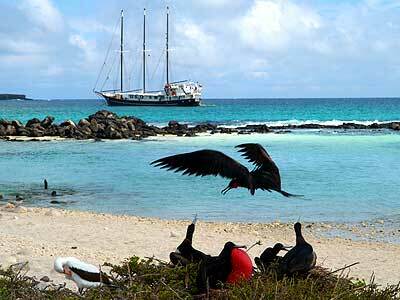 On any of the rocky shores in the Galapagos Islands, you will see a variety of resident and migratory shore birds. 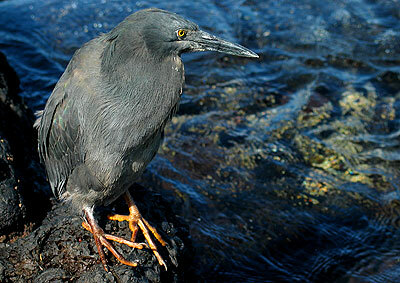 The Lava Heron is found only in Galapagos and can be seen and photographed at many visitor sites. The Flightless Cormorant is another species found only in Galapagos and only on the shores of Isabela and Fernandina islands. 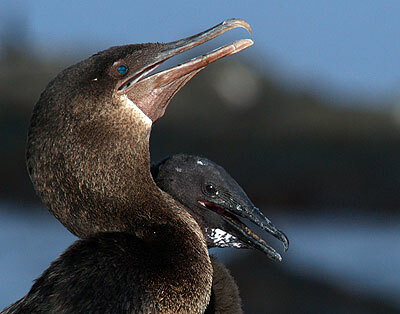 This is an adult with a chick that were seen on their rudimentary nest at Punta Espinosa. 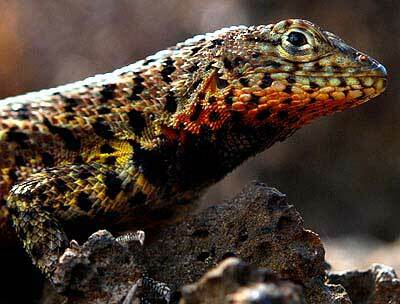 The Lava Lizard is also a species endemic to the Galapagos and found at almost all visitor sites. There are a number of different subspecies that vary in size and coloration. This large beautiful male was seen in the tortoise pens at the Charles Darwin Research Station in Puerto Ayora on Santa Cruz Island. 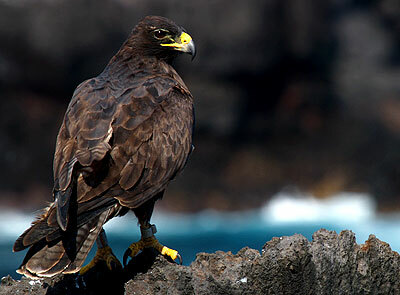 Another endemic species, the Galapagos Hawk is found on almost every island. 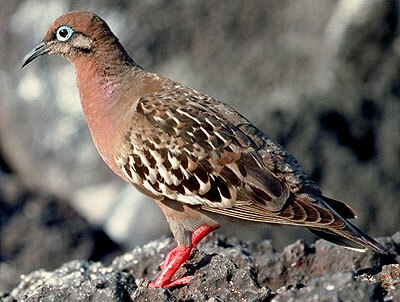 Found only in Galapagos, the doves were once found in staggering abundance on the islands. They are usually now only found in small solitary groups foraging amongst the vegetation. Plaza Island is one of the few locations where it is possible to get an "upfront and personal" look at these magnificent, prehistoric-looking creatures. This large male was devouring a cactus pad spines and all! This was on the trip of the "sharks and rays" where my son and I saw and snorkeled with one or the other (or both) both at almost every opportunity. 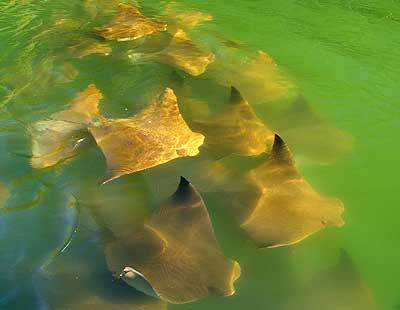 While at Caleta Tortuga Negra on the north shore of Santa Cruz Island, we observed over one hundred rays. 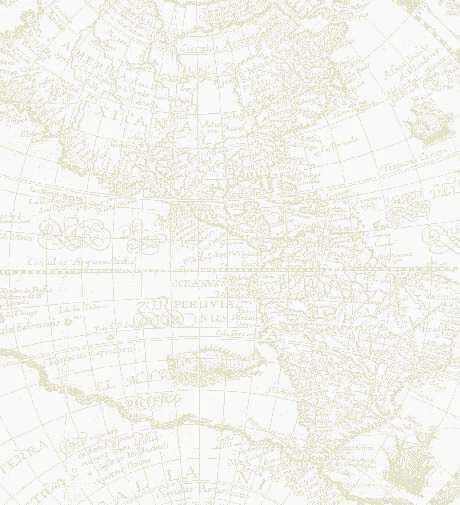 This school slowly swam alongside us and under our zodiac. Enjoy the wonders of the Galapagos Islands as if your were seeing this magnificent world for the first time through the eyes of a child. 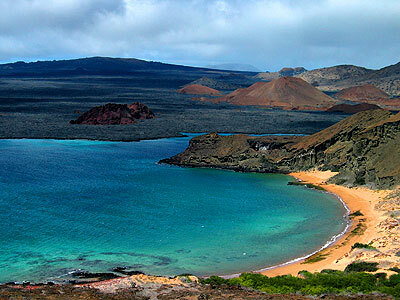 The Galapagos Islands is a World Heritage Site protected for the benefit of future generations. There are many beautiful white (and black and red) sand beaches in the Galapagos Islands where you will have time to relax, swim, snorkel and play. Devil's Crown is a small islet just off of Punta Cormorant on Floreana Island. It's one of the best places in Galapagos to snorkel and a great place to see turtles, sharks, rays, penguins and a myriad of colorful fish!